O Breath of Life, come sweeping thru us, invest in us new life and power. O Breath of Life, come cleanse, renew us, fit your Church to meet this hour. 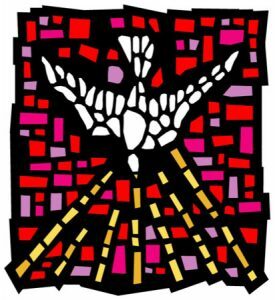 The stained glass window in our Commons depicts the Holy Spirit as a white dove descending amidst the brilliant reds. The window was originally designed for our chapel by our Pastor Emeritus, Don Burke, and Bob Markert, glass artist of our Sanctuary windows and the windows in our Fellowship Hall. Come and hear the good news of God’s spirit-work in the ancient church and learn how we may also be renewed!